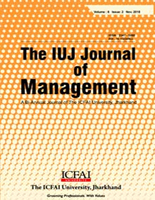 The IUJ Journal of Management (IUJ-JOM) is the flagship journal of ICFAI University Jharkhand, Ranchi. The aim of the journal is to provide insight into the business and management research. It also creates a platform for the researchers, academicians, professors , practicing management professionals and proponents in disseminating original, theoretical and applied research in the field of management and allied disciplines. The Journal is a Bi-Annual (November and May), double blind reviewed journal, . . . . .Read more. Teaching Aptitude can be defined as a condition or set of characteristics possessed by an individual, indicative of the ability to grasp not only the subject matter but also the aims and processes of education (Dave N. and Raval D., 2015). It predicts a person's ability to explain difficult points and clarify obscurities. Right aptitude is the source to create competitive advantage for the organization and higher educational institutes, . . . . . .Read more. researchers/academicians and organizations are focusing highly on assessment of the effectiveness of advertisement since long. . . . . .Read more. customer satisfaction to service organizations in general and banking in particular has received extensive attention in recent years. . . . .Read more. CALL FOR PAPERS Last date for receiving the paper: 20th March 2019. Keywords : Aptitude, Teaching, Teachers, Colleges, Government aided, Self Financed, Institutions, Attitude, Cooperation, Optimism. In a competitive globalized era, higher education institutions need to concentrate on employee aptitude to ensure right performance and delivery. A right aptitude can trigger thrust for development and may ensure holistic development in this competitive world. Teaching community is not merely treated as the factor of production but is important in determining fate of a nation as well as of a race. Right aptitude is the source to create competitive advantage for the organization and higher educational institutes, hence focus should be given on identification and development of right policies and strategies to nurture develop and evaluate right aptitude among employees and teachers. The teacher`s performance also depends on structure, strategy and policy followed, physiological and psychological environment, motivational methods etc followed by organization as a synchronized tool. The objective of this article is to compare the teaching aptitude of teachers working in Government aided and self financed institutions and also to highlight the components of teaching aptitude for male and female teachers. For this purpose, a Teaching Aptitude Test survey was conducted among the male and female teachers separately in Government aided and self financed University affiliated colleges in National Capital Region, India. An analysis of the results showed that the mean aptitude rating is higher among male teachers than female teachers. Besides, male teachers in Government aided colleges have better aptitude than those in Self-Financed colleges and Vice Versa in the case of female teachers. It was also found that scores in individual Aptitude Components are also different for male and female teachers. Ashok Kumar Asthana & O R S Rao, A Comparative Study of Teaching Aptitude among Teachers of Government aided and Self Financed Colleges in NCR.IUJ Journal of Management; Vol.6, No.2, Nov.2018. Keywords : Advertising effectiveness, Media types, Relationship matrix. Surendra Kumar & Dr. Alok Kumar Rai, A Conceptual Framework for Exploring Relationship Matrix Between Advertising Effectiveness And Media Types. IUJ Journal of Management; Vol.6, No.2, Nov.2018. Keywords : Customer services quality, Customer satisfaction, Bank service provider, Organization, Customer. Dr. Mamta Brahmbhatt, Customer services quality, Customer satisfaction, Bank service provider, Organization, Customer. IUJ Journal of Management; Vol.6, No.2, Nov.2018. Keywords : Theory of applied behavior, entrepreneurial intentions, senior executives, work experience, entrepreneurship. The role of entrepreneurs in generating employment is well-known. To promote and initiate sustainable venture creation a better understanding the 'push' and 'pull' factors that affect the entrepreneurs is needed. Experienced professionals often quit their jobs to start their own ventures. However, existing research offers few theory-backed, consistent frameworks that throw light on entrepreneurial intentions of such individuals. This paper aims to test the relevance of an intentions model by applying it on a select group of. The behavior-intention link is probed using Ajzen's Theory of Planned Behavior.A questionnaire consisting of 31 items was administered online to senior executives pursuing distance learning courses in management from a private university. The questions were Likert-type questions with 7 scales. Items used in the questionnaire probed into the respondents' views on why people start their own business and the various factors that promote or deter this process. Analysis of the data obtained from the respondents was found to correspond to the three parameters of the Theory of Planned Behavior- namely attitude, subjective norms and perceived behavior control. The data was found to have high reliability.Though there was a great deal of variance in the entrepreneurial intent of the respondents, there was no difference on the impact of the three parameters on entrepreneurial intent. This finding suggests that intentions exist in all individuals which transform into desired behavior (venture creation).In future, the results of this study are proposed to be tested on a group of nascent/yet-to-start entrepreneurs to further establish the intention-behavior link. K Satyalakshmi, Dr Pallavi Kumari & Dr. Dr Sukanya, Theory of applied behavior, entrepreneurial intentions, senior executives, work experience, entrepreneurship. IUJ Journal of Management; Vol.6, No.2, Nov.2018. Keywords : Handicraft, Schemes, Awareness, Government, Advertising etc. Dr. Dilip Kumar & Dr. Manish Kumar, Awareness Of Government Initiated Schemes : A Study Of Handicraft Sector In Mirzapur. IUJ Journal of Management; Vol.6, No.2, Nov.2018. Keywords : Adoption, consumer adoption, mobile payment system, Ranchi, Kolkata. Indian mobile payment landscape has shown incremental growth in the recent past. Government is taking various steps to make India cashless. Recently, our Prime minister has launched BHIM, RuPay and SBI app in Singapore. This can be described as a major step towards internationalization of Indian payment platforms. People also are supporting vision of cashless India as it is evident from the increase in number of mobile payment users in the last three years. Also because smartphone has penetrated so well into the lifestyle of Indians that people now prefer everything that can be done by few taps on their Smartphone. The purpose of this research is to find the difference in level of awareness of Mobile Payment System among consumers of Ranchi and Kolkata. The research used survey method and questionnaire was distributed for primary data collection. Respondent involved customers of Ranchi and Kolkata city. 100 customers from each city were studied.MS Excel was used for data analysis. Sonal, Dr. Vishal Kumar & Dr. Kirti R Swain, Awareness Of Mobile Payment System Among Consumers : A Comparative Study In Ranchi And Kolkata. IUJ Journal of Management; Vol.6, No.2, Nov.2018. Keywords : Children, Consumer Behavior, Food choice, Consumer socialization. Shilpi Raj , Dr. Rajkiran Prabhakar & Mahendra Singh, Children's Buying Behavior For Food Products : Review Of Scope And Challenges. IUJ Journal of Management; Vol.6, No.2, Nov.2018. Keywords : Risk, Risk perception, investors, Investment decision. Palash Bairagi & Dr. Anindita Chakraborty, Effect Of Gender, Age And Income On Investors' Risk Perception In Investment Decision : A Survey Study. IUJ Journal of Management; Vol.6, No.2, Nov.2018. Keywords : Organic Products, Socially Responsible Consumption, Consumer Attitude. Vijay Amrit Raj & Dr. Usha Kiran Rai, Factor Influencing Consumers Attitude towards Organic Products. IUJ Journal of Management; Vol.6, No.2, Nov.2018. Sushmita Singh & Prof. Raj Kumar, Government Intervention - Awareness & Outreach Among Handloom Weavers in Varanasi. IUJ Journal of Management; Vol.6, No.2, Nov.2018. Happiness is a psychological concept and it is subjective in nature. Amidst all sorts of facilities and accomplishments, one won't be happy unless and until s/he feels to be happy. Similarly, with the same set of achievements, while one makes himself/herself happy, another may find him/her far away from happiness. Profession of an individual is one of the many factors that determine his/her happiness. Teaching has been treated as a sacred profession since time immemorial and hence those who like to serve the society with peace and earn respectful life, they have been preferring teaching profession. In fact, teachers prior to recent past, were deriving pleasure and happiness out of their contribution in building the nation by way of sharing knowledge. And the taught were the cause of happiness for the teachers as they were giving utmost respect to the teachers. But the dynamics of teaching profession, particularly in higher education sector of India, have been overhauled in recent years. Most of the teachers are taking up the teaching profession just for the sake of earning livelihood and getting pleasure out of negativities like number of holidays and leaves, class suspensions, no interest of the taught in the classrooms, promotions or hikes even without adding any value and so on. Keeping this in backdrop, it has been thought to unfold the positive (what it is?) and normative (what it ought to be?) aspects of happiness in teaching profession, particularly in higher education sector of India. Dr. Sukanta Chandra Swain, Normative and Positive Aspects of Happiness in Teaching Profession : A Study of Higher Educational Institutions of India. IUJ Journal of Management; Vol.6, No.2, Nov.2018. Keywords : Customer Relationship, CRM technology, Organizational incentive, Organizational Capital. Customer Relationship Management has been researched extensively in past decade and there are ample evidence that it improves the organizational peformance in terms of customer retention, customer satisfaction, and customer value development. However, not every organization has been able to use the technology associated with CRM and due to this lack of proper usage of CRM systems, poor performances have slo been reported. One of the ways to facilitate the use of CRM technology in an organization could be to support the CRM implementation with proper employee training, customer relationship orientation, support from top management, and improved organizational incentive and reward system. All these factors are summed up in a multidimensional construct i.e., Organizational Capital. This paper examines the importance of Organizational Capital as an antecedant of CRM technology use. The results of this study depict that Organizational Capital positively influence the CRM technology use in an organization and thus is a antecedant to CRM technology use. Further, the implications for managers are also presented. Waseem John, Organizational Capital as an antecedent to CRM Technology use : A study of the pharmaceutical sector in India. IUJ Journal of Management; Vol.6, No.2, Nov.2018. Harsha Bhargavi Pandiri, Polyhouse farming as rural entrepreneurship : Experience of Telangana state polyhouse farmers. IUJ Journal of Management; Vol.6, No.2, Nov.2018. Sarosh Kothandath, Project Success Criteria Preferences. IUJ Journal of Management; Vol.6, No.2, Nov.2018. Keywords : Customer Attitude, M- Commerce, Higher Education Sector. higher education sector in India. The self- administered questionnaire was designed to collect the data. A sample of 161 students was taken for the research study. The major finding of the study is that the customer attitude is the influencing force towards use of M-Commerce in educational institutes which signifies that students in this sector are willing to buy online and update themselves through mobile apps. The analysis represents one of the primary studies in Indian educational sector that focuses on the cause and effect relationship of Customer Attitude with M-Commerce in context to the higher education. Himanshu Kargeti , Dr. Vikas Singh & Ms. Shilpa Wadhwa, Role of Customer Attitude towards use of M-Commerce : A Study of Higher Education Students. IUJ Journal of Management; Vol.6, No.2, Nov.2018. Gayatri Nayak & S.K. Padhi, The Time Allocation Behaviour of Working Women in Organized Sector : Empirical Evidence from Urban Odisha. IUJ Journal of Management; Vol.6, No.2, Nov.2018. Barbara Weber, Mirjam Staub-Bisang & Hans Wilhelm Alfen, Infrastructure as an Asset Class Investment Strategy, Sustainability, Project Finance and PPP. IUJ Journal of Management; Vol.6, No.2, Nov.2018.